Beach trips are a major part of our summer in my family. 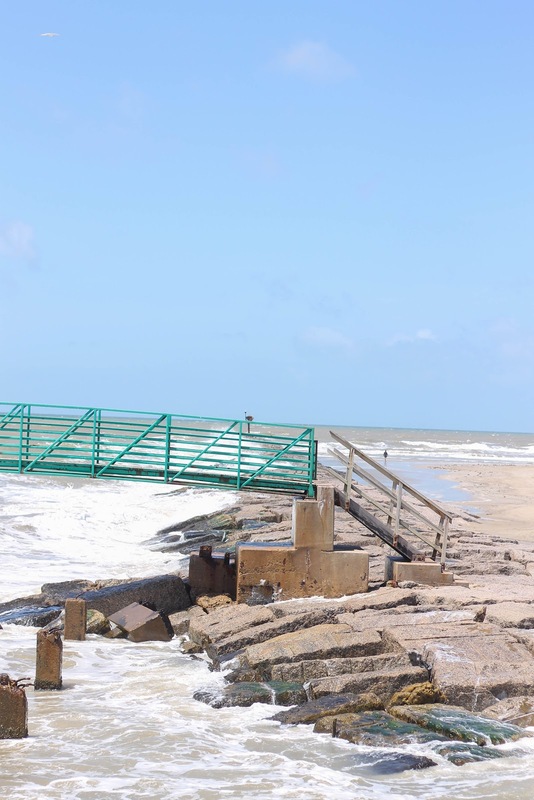 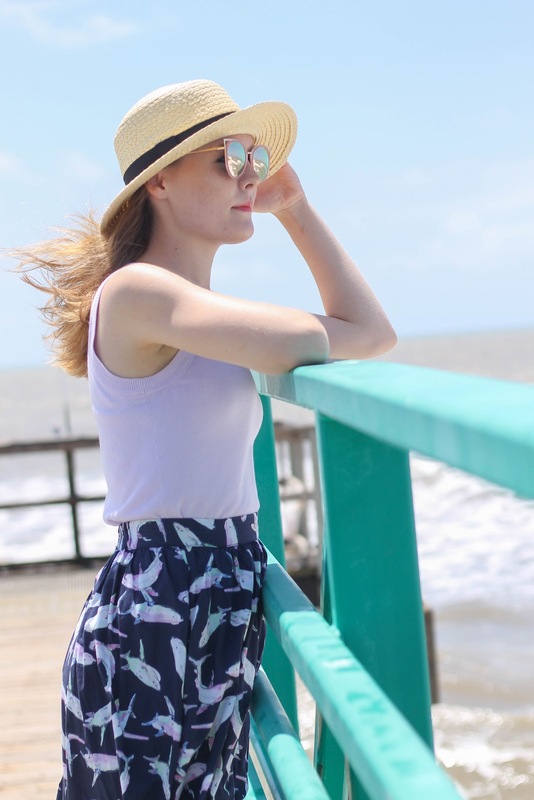 I personally love to sit on the beach and listen to the waves crash along the shore while reading a good book, walk along the shoreline looking for shells, meander along docks or decks, and venture out onto the jettis' that jut out into the water. 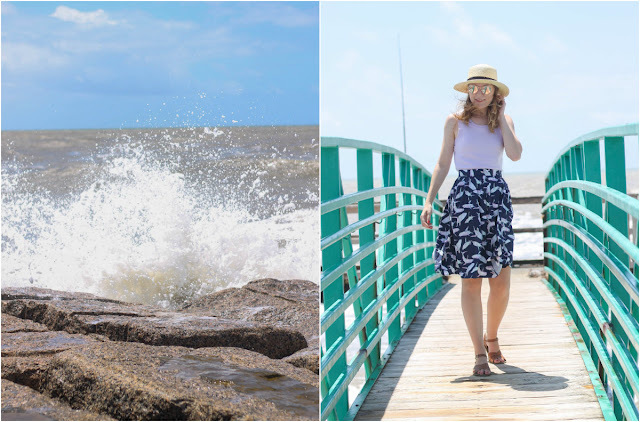 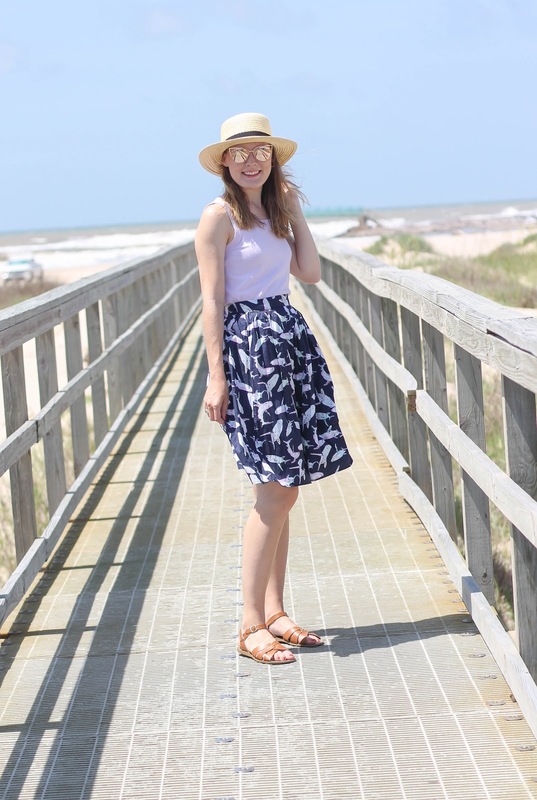 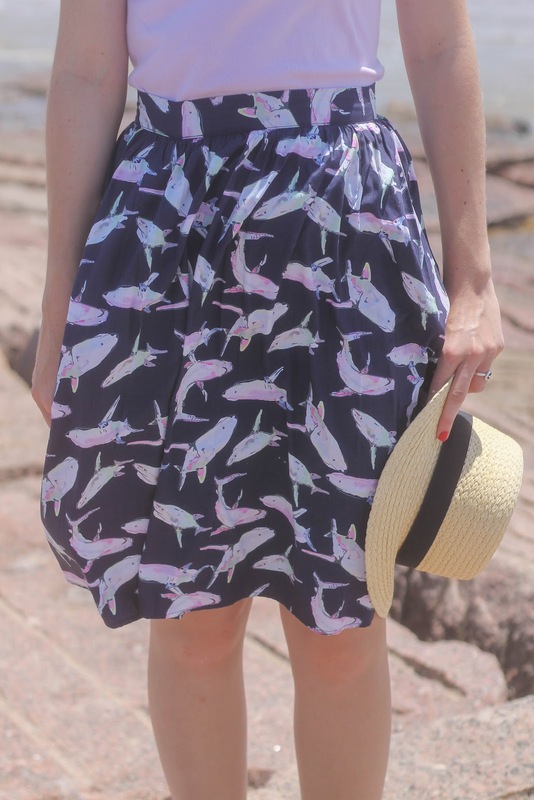 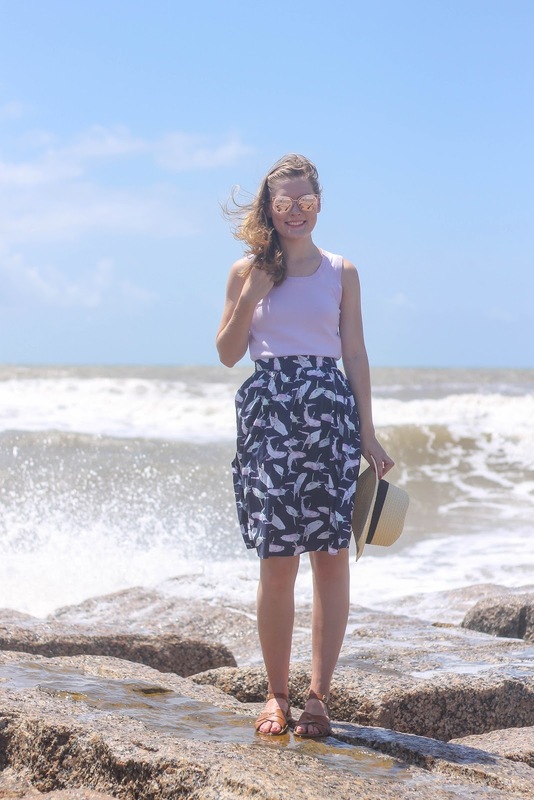 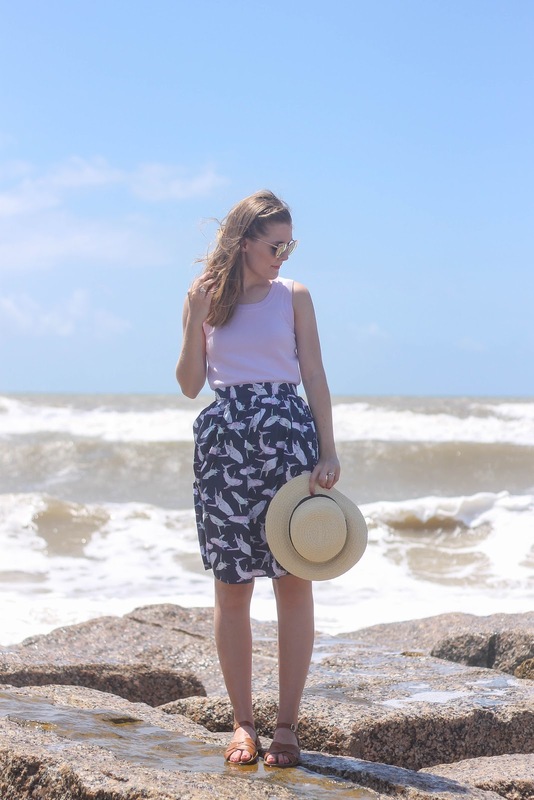 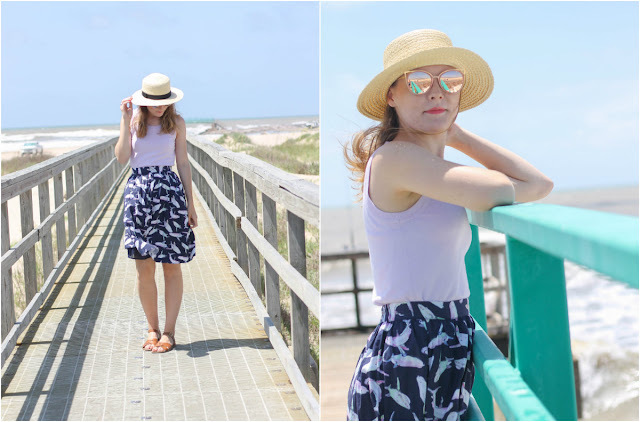 With beaches being such a big part of my summer holidays its no wonder that a sea life inspired skirt from Modcloth is one of my favorite summer pieces. 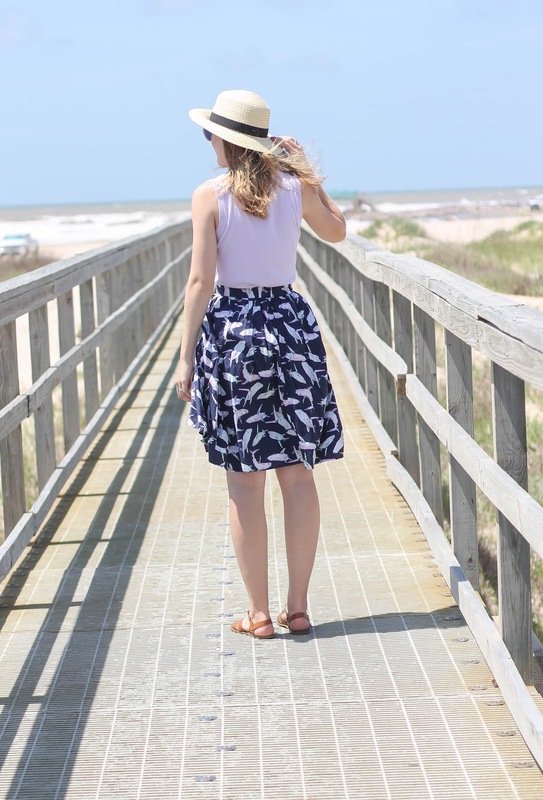 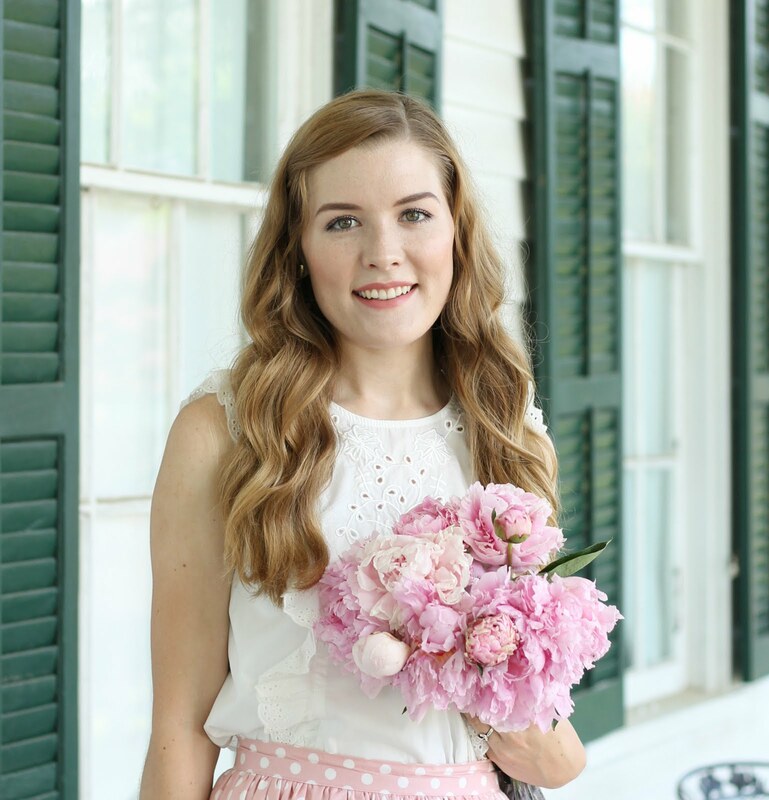 However, this skirt isn't just any ordinary print, it is a frenzy of sharks and the back story behind this skirt purchase is still quite comical to this day. 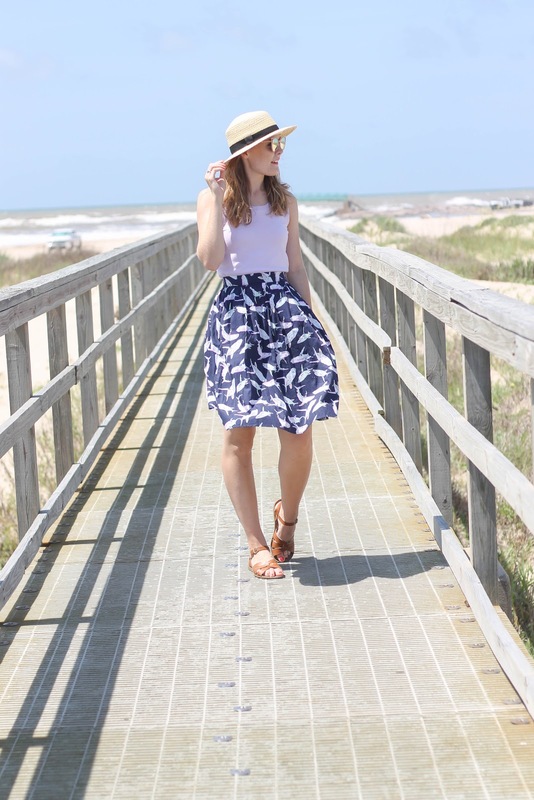 I'm so glad I decided to pack this outfit for one of our first beach trips this summer because it was the perfect thing to walk along the dock and jetti in. 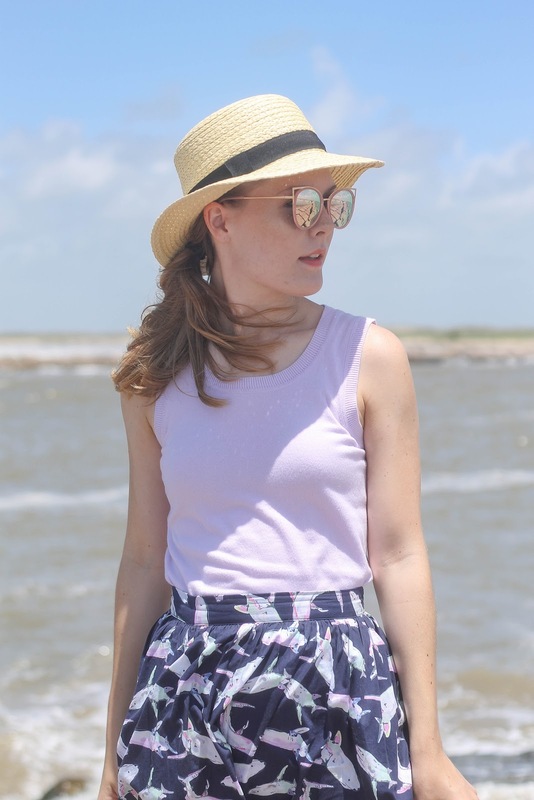 Since the print on this skirt is a navy background with watercolor sharks I decided to pair this lavender sweater tank with it to pull out the pastel colors. 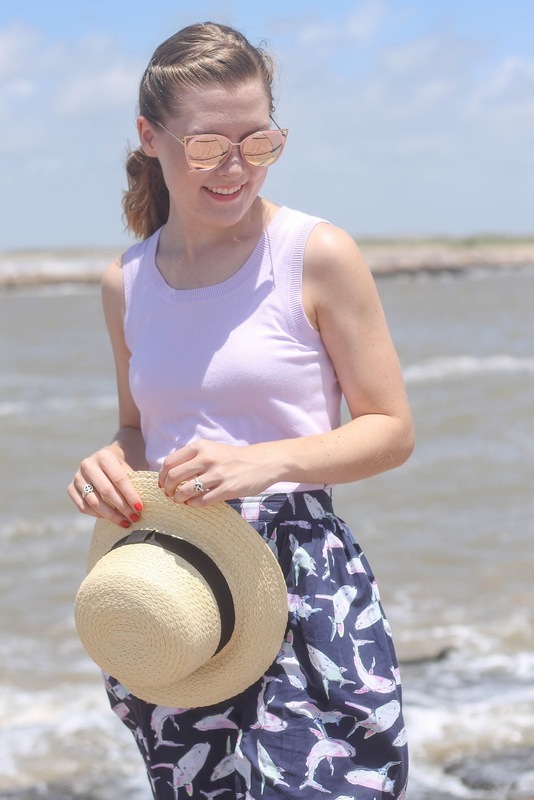 And as is with any beach trip this pale girl never goes anywhere without a hat and a pair of sunglasses so this boater I picked up for the summer was the perfect thing to keep me shaded from the sun and these fun modern cat eye sunglasses were the perfect pop of pink! 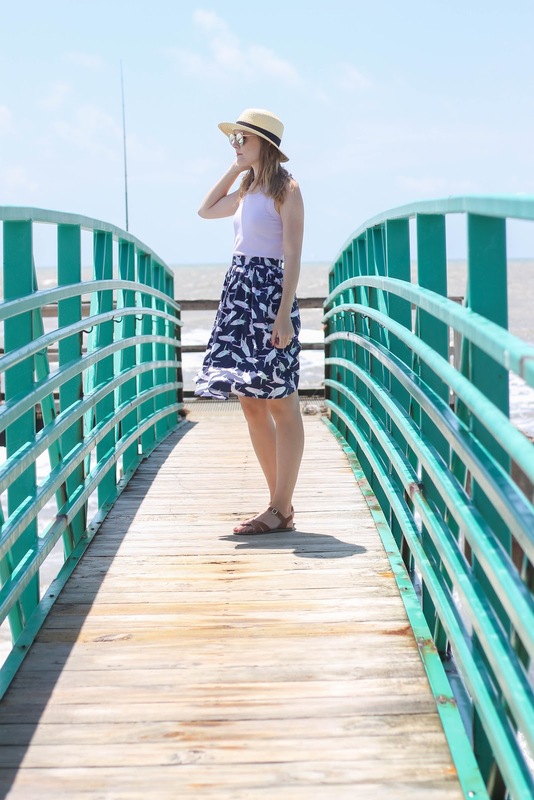 No matter where I go I am always dressing for the scenery around me, so if I am going to the beach you can bet something nautical or ocean inspired is coming with me!